This is an airport restaurant located in San Diego International Airport, Terminal 2. The restaurant shares a kitchen with a fast food place. The food was quite meh. Not because it shared a kitchen with a fast food place though. Although we both try not to eat too much fast food anymore, we do like some fast food places which I will not name, but it doesn’t start with a “M” or “K” or “B”. I know airport food aren’t supposed to be good (WHY IS THAT? ), thus when we found one that’s good, we are surprised. See my write-up on that one HERE. The burger I ordered here tasted like grey mush matters (whatever that means.) 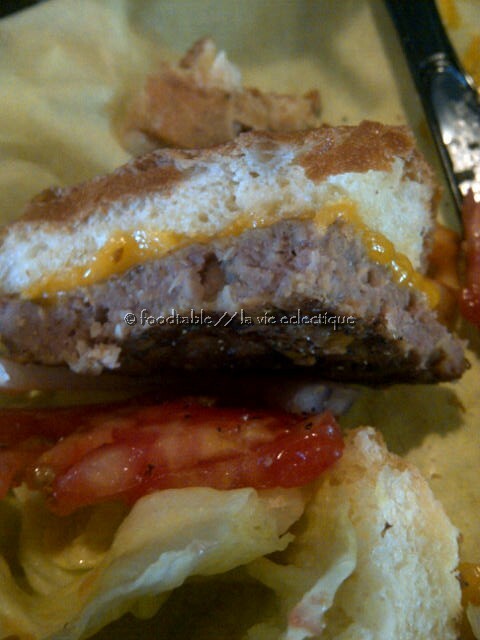 I cut up the burger that I couldn’t eat to show you what it looks like… The Portobello burger fared much better. So if you have to eat, eat the vegetarian selections and don’t eat meat here. The only thing that was quite decent is those cross-cut fries but even those are quite spooky and oily. I probably won’t go back to Bloody Mary’s next time we are in town and flying out of that terminal because it’s bloody meh. ← Mindful Monday: Step it up! That’s a shame that a restaurant with such a cool name is so bleh! I love Changi Airport in Singapore. If your plane is late, they will give free food vouchers so you can have some food while you wait for your flight. That just looks gross! I hope you have better luck next time!